As Pakistan’s new leader, his remarks on Indo-Pakistan relations seem reassuring. But will the army allow him the liberty of taking his own decisions? 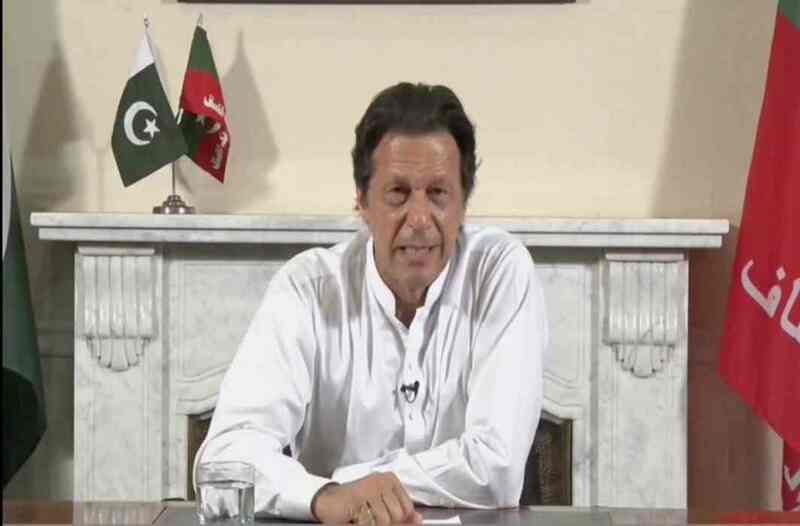 Cricketer-turned-politician Imran Khan is now set to become Pakistan’s new prime minister, fulfilling a burning desire he had for the top office since his first foray into politics in 1997. Many people in Pakistan, tired of the corrupt politics of major national parties—the Pakistan Muslim League (Nawaz) (PML(N)) and the Pakistan People’s Party (PPP)—were ready to give Khan’s Pakistan Tehreek-e-Insaf (PTI) a chance. Whether the novice, with little experience of governance, will be able to deliver remains to be seen. But for the moment, Imran’s impressive showing across the country, including Punjab, the well-known bastion of the Sharif brothers, indicates a desire by the people for change. But ordinary Pakistanis are hopeful that Imran will bring in a “naya Pakistan’’. Much like India and other countries in the sub-continent, dynastic politics have so far been the norm in Pakistan. This has now been broken. A fresh start with a popular leader should augur well for the country. “This is a moment of opportunity and hope,’’ Salman Bashir, Pakistan’s former foreign secretary and high commissioner to India, told India Legal. Whatever his flaws (and there are many), Imran is not corrupt. The fact remains that people want change and he is regarded as an agent of it. His slogan of a “new Pakistan” has worked for millions of Pakistanis from the poor to the middle class. Yet, it is also true that, despite his fight against corruption, Imran has opened the doors of his party to hoards of corrupt political leaders from the PML(N) and PPP, much like what Narendra Modi did in India in 2014. But he added the rider that “the core issue is Kashmir. We should sit across the table to solve the issue, instead of indulging in a blame game”. Indians are angry at this, but for any Pakistani politician, Kashmir cannot be ignored. He also spoke of the Indian media painting him as a Bollywood villain. However, there is unlikely to be much change in Pakis­tan’s India policy, as the army anyway calls the shots. The rhetoric perhaps may become more shrill on both sides as India gets into election gear. Imran himself will concentrate on domestic issues in the first few months of rule. Despite Imran’s impressive showing, it is well-known that the match was fixed in his favour. The Pakistan army cleared the decks for the PTI and ensured that the PML(N), with its strong support base in Punjab, was pulverised through defections. The stage was set for the PTI as soon as Nawaz tried to take on the army for its constant meddling in the civilian government and his attempt to side-step it in relations with India. Soon after the 2013 national elections in Pakistan, which brought Nawaz to power, Imran literally shut down Islamabad with a five-month-long sit-in agitation. His demand was that Nawaz step down as the elections were rigged. This could not have been carried out without the backing of the GHQ in Rawalpindi. Nawaz’s desire for peace with India and Modi’s detour to Lahore on the way back from Kabul on Christmas Day in 2014 ruffled the army, which was kept out of the loop. The hope of improved ties was soon laid to rest by the terrorist strike on India’s frontline Pathankot air force base as well as a deadly attack on a camp in Uri. Nawaz’s attempts to get the military establishment to co-operate were foiled. India-Pakistan ties deteriorated drastically since then. Firing across the LoC became the norm. Relations between the army and Nawaz’s government remained tense. It came to a head in 2016 with the Dawn leaks. At a high-level meeting, the civilian government told the army that Pakistan would face international isolation unless the security forces acted against terrorists. This created a huge flutter. Though the government backed off, the die was cast. Nawaz had to go. The Panama Papers provided a perfect excuse to try him and his sons. Pakistan’s judiciary played its part as well in Nawaz’s ouster. Months before the Panama trial, he was banned for life from contesting elections. This was because he had failed to declare a fee that was paid to him by his son’s company while he was in exile in Saudi Arabia. Nawaz never touched this fund, but he was hauled up for not declaring this amount on the election form. He was untruthful and had not followed the Koran, so he was not fit to rule a Muslim State, it was stated. This was a massive blow to Nawaz and he had to step down as PM. It is alleged that the judiciary was keen on obliging the generals who wanted Nawaz out. The Panama court trial verdict was equally harsh. But there was substance in the allegations, unlike the earlier case. Nawaz was sentenced to 10 years’ rigorous imprisonment, while his daughter and heir apparent, Maryam, has to spend seven years in jail. The Pakistani judiciary was not always so supine. 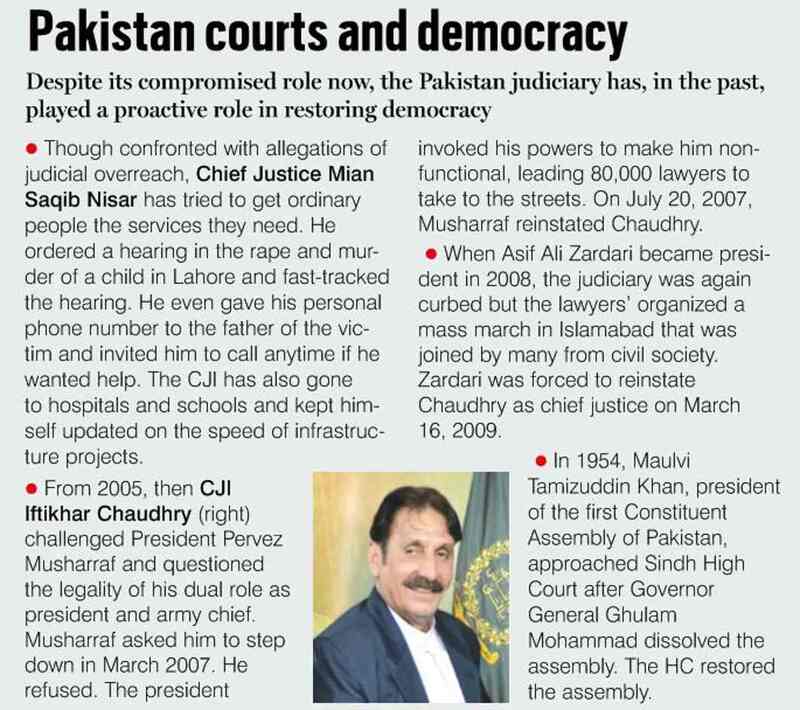 Chief Justice Iftikhar Chaudhry was responsible for defying the all-powerful military dictator and former President Pervez Musharraf. Angry at the chief justice on grounds of alleged misconduct, Musharraf asked him to step down in March 2007. Instead of quietly doing so, the chief justice refused to follow orders. However, the powerful executive president invoked his powers to make him non-functional. The shoddy treatment of the chief justice galvanised lawyers who took to the streets against General Musharraf, forcing the strongman to reinstate Chaudhry. Now, however, the equation is entirely different. It is alleged that the powerful Pakistani military had a big hand in getting the judges to comply and rule against Nawaz. There is also a move now to hold Nawaz’s trial in jail and not in the open court. Sharif’s lawyers have argued that this is against the transparency of the hearing and unfair to the former president. A final call has not yet been taken. With Imran as prime minister, Nawaz is unlikely to get any concession. A major worry for India and the international community is the number of alleged candidates from radical groups who have contested the polls. Pakistan has a tradition of not electing overtly religious or radical groups to the National Assembly. This time, there were as many as 460 candidates who may have terror links. Hafiz Saeed’s son and son-in-law were in the fray from the banned Jamat-ud-Dawa. India alleges that Saeed is the mastermind behind the Mumbai terror attacks of 2008. Both have lost the elections and so have most of the other terror linked proxies. The people of Pakistan have kept up the tradition of not voting for fundamentalist religious candidates. It waits to be seen how Imran will tackle the hardliners and yet keep the middle class happy. There will be much tightrope walking to do.